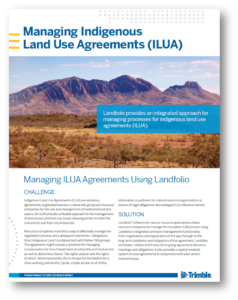 Landfolio provides an integrated approach for managing indigenous land use agreements (ILUA) processes. Indigenous Land Use Agreements (ILUA) are voluntary agreements negotiated between a native title group and resource companies for the use and management of traditional land and waters. An ILUA provides a flexible approach to the management of land access and land use issues allowing parties to tailor the outcome to suit their circumstances. Resource companies must find a way to effectively manage the negotiation process and subsequent outcomes / obligations of an Indigenous Land Use Agreement (ILUA) with Native Title groups. The agreement might include a provision for managing compensation for loss/impairment of native title and land access as well as define how Native Title rights coexist with the rights of others. Most importantly, the ILUA lays the foundation for a close working partnership. Quick, simple access to all of this information is pertinent for natural resource organizations to ensure all legal obligations are managed in an effective manner. Landfolio® software for natural resources allows resource companies to manage the complete ILUA process using Landfolio’s integrated contracts management functionality. From negotiations and registration all the way through to the long term conditions and obligations of the agreement, Landfolio schedules, notifies and tracks all on-going agreement decisions, meetings and obligations. It also provides a spatial-enabled system to view ILUA agreements in conjunction with your land or mineral tenure.